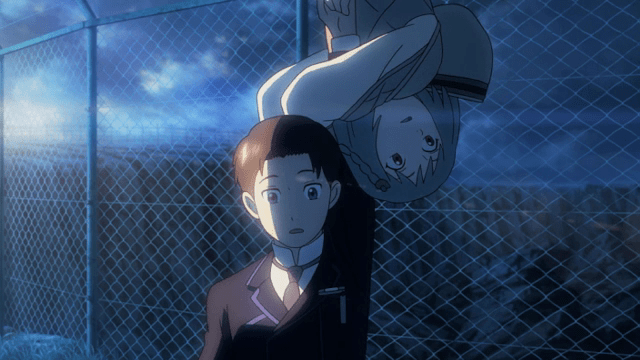 Offering an interesting twist (pardon that awful pun), Patema Inverted didn’t disappoint when it had its UK premiere at the Glasgow Film Theatre this month. Yet to be released in Japan and only featuring as 33-year-old Yasuhiro Yoshiura’s fourth film in which he’s posted as the director and screenwriter; a slight sense of anticipation was apparent amongst the close to capacity crowd in the GFT’s Screen One. The narrative follows the young protagonist Patema, who has lived her entire life in the dark confines of her subterranean home, as a result of a disastrous bid to utilize energy from earth’s gravity. Carefree, intrepid and naïve, Patema – going against her carer Jii and others’ wishes – heads to explore the deserted chambers of the “Danger Zone”; overtly curious to discover why it is so forbidden. Inadvertently, Patema finds herself on earth’s surface; viewing the sky and grass of which she had only previously seen in a photograph. Trying to cling to earth for survival, Patema meets Age, a boy who shares her inquisitive nature. With his help, Patema seeks to return underground from the threat of the autocratic regime that regards her people as subordinate “inverts”. On the surface, the film’s bold, striking detail and design, coupled with its well structured, character-driven plot, hold the feature aloft as Yoshiura’s finest work to date – a man having honed his talents through his artistic involvement in the record grossing Evangelion series and acclaimed Pale Cocoon.